The protocol was carried out to 4 hours postresuscitation (PR). Rats were hemorrhaged (H) to 40% of their baseline (BL) mean arterial pressure (MAP) and maintained at this pressure for 60 minutes by infusion or withdrawal of shed blood as needed. For resuscitation (R), shed blood was returned over 5 minutes, followed by infusion of 2 equal volumes of lactated Ringers (LR) solution over 25 minutes. This hemorrhagic shock model carries a mortality of 27% at 24 hours postresuscitation.5 MC-2 was given (50 mg/kg, intravenously [IV]) at the time of return of shed blood. Effective hepatic blood flow was stable across the entire protocol in the sham and sham+MC-2 groups. In the hemorrhagic shock (HS)/conventional resuscitation (CR) groups, EHBF was decreased during the period of shock and restored by resuscitation (RES) in both the HS/CR groups. However, EHBF decreased incrementally over the 4 hour post RES period. HS/CR+MC-2 increased EHBF compared to HS/CR alone at 3 hours and 4-hours postresuscitation. P values calculated by 2-way analysis of variance and Tukey-Kramer honestly significant difference test. aP < .05 vs baseline (BL). bP < .05 vs sham. cP < .05 vs sham+MC-2. dP < .05 vs HS/CR. There were no differences evident in injury score between the sham and sham+MC-2 groups, and all samples were graded as no or minimal injury. In the hemorrhagic shock (HS)/conventional resuscitation (CR) group, focal and centrilobular necrosis is evident, while in the HS/CR+MC-2 group, most samples were graded as focal necrosis. Original magnification is ×10. Importance Hemorrhagic shock (HS) due to trauma remains a major cause of morbidity and mortality in the United States, despite continuing progression of advanced life support and treatment. Trauma is the third most common cause of death worldwide and is the leading cause of death in the 1- to 44-year-old age group. Hemorrhagic shock often progresses to multiple organ failure despite conventional resuscitation (CR) that restores central hemodynamics. Objective To examine whether MC-2 would bind glycosaminoglycans to decrease proinflammatory cytokines’ influence in the liver, minimize organ edema, prevent liver injury, and improve hepatic perfusion. MC-2, a synthetic octapeptide derived from the heparin-binding domain of murine interferon gamma (IFN-γ), binds glycosaminoglycans to modulate serum and interstitial cytokine levels and activity. Design, Setting, and Participants A controlled laboratory study of 3y male Sprague-Dawley rats that were randomized to 4 groups of 8 each: sham, sham+MC-2 (50 mg/kg), HS/CR, or HS/CR+MC-2 (HS = 40% of baseline mean arterial pressure for 60 minutes; CR = return of shed blood and 2 volumes of saline). The study began in March, 2013. Main Outcomes and Measures Effective hepatic blood flow (EHBF) by galactose clearance, wet-dry weights, cytokines, histopathology, complete metabolic panel, and complete blood cell count were performed at 4 hours after CR. Results MC-2 partially reversed the HS/CR–induced hepatic hypoperfusion at 3 and 4 hours postresuscitation compared with HS/CR alone. Effective hepatic blood flow decreased during the HS period from __mL/min/100g and _mL/min/100g at baseline to __mL/min/100g and __mL/min/100g for the HS/CR and HS/CR+MC-2 groups, respectively (P <.05). Effective hepatic blood flow remained constant in the sham groups throughout the experimental protocol. Organ edema was increased in the ileum and liver in the HS/CR vs sham group, and MC-2 decreased edema in the ileum vs the HS/CR group. MC-2 in HS also decreased levels of alanine aminotransferase, zonula occludens-1, and interleukin-1β compared with HS/CR alone. Conclusions and Relevance MC-2 was associated with decreased liver injury, enhanced effective hepatic blood flow, decreased cytokines, and prevention of edema formation in the ileum when administered with CR following HS. These data suggest that the MC-2 peptide could be a potential therapeutic approach to target cytokine and chemokine interactions, which might limit multiple organ failure and decrease mortality in hemorrhagic shock. Hemorrhagic shock (HS) due to trauma is the third most common cause of death worldwide and the leading cause of death in people aged 1 to 44 years.1-3 The roles of the gut and liver in the progression to multiple organ failure (MOF) are not clear.4,5 Downmodulation of the systemic inflammatory process during resuscitation might be beneficial in the treatment of HS.6,7 We examined the ability of a novel peptide, MC-2, to inhibit proinflammatory cytokines, prevent edema, and improve hepatic perfusion in an experimental model of resuscitated HS. We hypothesized that MC-2 could limit SIRS inflammatory effects on sinusoid function to minimize edema formation and improve liver perfusion. To assess that hypothesis, we pursued several aims in our study of resuscitated HS with and without MC-2: (1) assess liver injury, (2) quantify effective hepatic blood flow, (3) evaluate total tissue water (organ edema), and (4) measure the serum presence of several alarmins: lipopolysaccharide (LPS), zonula occludens–1 (ZO-1), high-mobility groupbox protein 1 (high-mobility group protein–1 [HMGB-1]), TNF-α, IL-1β, and IFN-γ. Studies were approved at the Robley Rex Veterans Affairs Medical Center by the Research and Development Committee, Biohazard Safety Committee, and Institutional Animal Care and Use Committee prior to work. Male Sprague-Dawley rats (200-250 g) were housed on a 12-hour light-dark cycle in the Association for Assessment and Accreditation of Laboratory Animal Care–accredited Veterinary Medical Unit, were acclimated for 1 to 2 weeks prior to use, and were fed standard rat chow (20 g/d) and water ad libitum. Body weights were recorded daily. Anesthesia was induced and maintained by pentobarbital injection (initial: 50 mg/kg intraperitonealy; supplemental:12.5 mg/kg subcutaneously as needed). Normal saline (2 mL subcutaneously) was given to maintain homeostasis. Body temperature (mean [SD], 37.0° [1.0°]C) was maintained by negative feedback controller, thermistor, and heating pad. After loss of blink and withdrawal reflexes, a tracheotomy was performed (polyethylene −240 tubing; Becton Dickinson), and rats spontaneously breathed room air. Cannulae (polyethylene−50) were inserted for monitoring blood pressure (left carotid artery), galactose infusion (left jugular vein), hemorrhage (left femoral artery), and resuscitation (left femoral vein). After 30 minutes for equilibration, mean arterial pressure (MAP) and heart rate (HR) were monitored (Digi-Med Signal Analyzers). Hemodynamic stability of less than 10% variation in MAP, HR, and serum galactose was required for initiation of the experimental protocol (Figure 1). Hemorrhagic shock was induced by withdrawal of 1 mL/min of blood into a heparin-rinsed syringe (10 mL) and continued for 1 hour by withdrawal or infusion as needed. Conventional blood and fluid resuscitation (CR) was defined as return of shed blood (5 minutes) followed by 2 volumes of lactated Ringers solution (25 minutes). MC-2 (50 mg/kg, R.F.-B.) was administered at the time of shed blood. Rats were randomized to groups, n = 8/group: (1) sham, (2) sham+MC-2, (3) HS/CR, or (4) HS/CR+MC-2. Effective hepatic blood flow (EHBF) by the galactose clearance technique is well described.18,19 Inherent assumptions are that systemic galactose is solely metabolized and cleared by the liver. Thus, steady-state galactose clearance accurately reflects liver blood flow. Steady-state galactose concentration was obtained by galactose bolus (2.6 mg/1 mL/5 min) and constant galactose infusion (13 mg/mL/h). We determined EHBF by the equation: EHBF = constant galactose infusion divided by steady-state galactose concentration. Complete metabolic panel (CMP, VS2 Machine [Abaxis Inc]) and complete blood cell count (CBC, HM5 [Abaxis Inc]) were performed. Complete metabolic panel provided levels of alanine aminotransferase (ALT), alkaline phosphatase, amylase, blood urea nitrogen (BUN), creatinine, total bilirubin, total protein, albumin, globulins, sodium, potassium, calcium, phosphate, and blood glucose. The BUN to creatinine ratio was calculated. The CBC count measured white blood cells, lymphocytes, lymphocyte percentage, monocytes, monocyte percentage, neutrophils, neutrophil percentage, red blood cell count, hemoglobin, hematocrit, mean corpuscular volume, mean corpuscular hemoglobin, mean corpuscular hemoglobin concentration, red blood cell count distribution width, platelets, platelet percentage, mean platelet volume, and platelet distribution width. The wet-dry (W-D) weight ratio (ie, total tissue water) in the liver, ileum, and lung samples was calculated. Tissue was rinsed in saline, blotted dry, weighed (≤30 minutes from harvest), dried at 50°C (for 3 to 4 weeks), then weighed daily until constant, and the W-D ratio was calculated. Data are expressed as mean (SEM), and differences between groups were determined by 1-way or 2-way analysis of variance using SigmaPlot software (version 13, Systat Software Inc). The null hypothesis was rejected a priori at P < .05. When analysis of variance showed differences, a post hoc test was applied: Tukey-Kramer, Bonferroni, or repeated-measures analysis of variance and Dunnett. During the hemorrhage period, MAP decreased to 40% of the baseline in the HS/CR and HS/CR+MC-2 groups (Figure 2B). Heart rate decreased in these groups compared with baseline or with the sham group (P < .05) (Figure 2A). Conventional resuscitation restored MAP and HR to baseline and sham levels with no differences in MAP or HR between the sham or sham+MC-2 groups, except at 15 minutes after the start of rescusitation fluids. At that time, MAP was decreased in the sham+MC-2 group after MC-2 infusion compared with the sham group (P < .05). Body weights were not different among groups (Table 1). Effective hepatic blood flow decreased during the HS period in the 2 HS/CR groups from __mL/min/100g and _mL/min/100g at baseline to __mL/min/100g and __mL/min/100g for the HS/CR and HS/CR+MC-2 groups, respectively (P <.05) (Figure 2C). Conventional resuscitation restored EHBF to sham levels 30 minutes after the start of rescusitation fluids in the HS/CR groups, but after CR, EHBF decreased compared with the sham group in both HS/CR groups as previously reported.22 MC-2 infusion in the HS/CR+MC-2 group increased EHBF at 3 and 4 hours after RES compared with HS/CR. Serum LPS levels were increased in the HS/CR group at 4 hours after RES vs sham, but MC-2 infusion in the HS/CR+MC-2 group trended toward improvement (not significant, P = .13). Serum ZO-1, a marker of intestinal tight junction injury, was increased in the HS/CR compared with sham groups, but MC-2 did not completely decrease HS/CR+MC-2 serum ZO-1 to sham levels. The ZO-1 mRNA levels showed a similar pattern of expression to the serum ZO-1 data (Table 1). Serum ALT and HMGB-1 proteins reflected liver injury (Table 1). The ALT and HMGB-1 groups increased in the HS/CR compared with sham groups, but HS/CR+MC-2 did not completely return serum ALT to sham levels. The HMGB-1 levels were restored to sham levels in the HS/CR+MC-2 group. Serum cytokines for TNF-α and IL-1β did not exhibit identical patterns of expression (Table 1). No differences were evident in any group for TNF-α, not unexpected at 4 hours after RES. The IL-1β levels were increased in the HS/CR group, and the addition of MC-2 in the HS/CR+MC-2 group was significantly associated with decreased IL-1β. Liver IFN-γ levels showed no differences between the sham groups, but HS/CR was significantly associated with elevated IFN-γ levels compared with sham or sham+MC-2. MC-2 in the HS/CR+MC-2 group did not completely return liver IFN-γ to sham levels. Histopathology in the lung, liver, and ileum was evaluated. In the lung, there was no evidence of injury in any group. In the liver, the sham and sham+MC-2 groups were graded as no or minimal injury. The HS/CR group had significant injury: 4 of 8 had focal necrosis, 3 of 8 had centrilobular necrosis, and 1 of 8 had submassive necrosis (Figure 3). In the HS/CR+MC-2 group, 6 of 8 were graded as focal necrosis and 2 of 8 as centrilobular necrosis. In the ileum, HS/CR induced mild changes compared with the sham or sham+MC-2 groups that were not statistically different among groups. These mild changes were distorted villus architecture with neutrophil infiltrations and loss of goblet cells, which suggest early ischemic ileal damage. The HS/CR+MC-2 group exhibited similar changes, but to a lesser degree and in fewer locations per field. The difference between the HS/CR and HS/CR+MC-2 groups was not statistically significant. The W-D weight ratios (ie, total tissue water) suggested edema formation in the liver and ileum in the HS/CR compared with the sham or sham+MC-2 groups (Table 1). The HS/CR+MC-2 liver W-D ratios trended toward decreased total tissue water compared with the HS/CR groups (not significant, P < .09). However, in the ileum, HS/CR+MC-2 W-D weight ratios were restored to baseline levels compared with HS/CR. There were no differences in lung W-D ratios. Table 2 shows the CMP and CBC data. The CMP data showed that alkaline phosphatase was decreased in the HS/CR+MC-2 group compared with the sham or HS/CR groups. Amylase was decreased in the HS/CR groups compared with the sham groups. While there were no differences in the BUN or creatinine levels across groups, the BUN to creatinine ratio was increased in the HS/CR+MC-2 group compared with the sham-alone levels. Sodium was elevated in the HS/CR+MC-2 group compared with the HS/CR-alone group, and calcium was decreased in both HS/CR groups compared with the sham groups. The HS/CR blood glucose levels were increased compared with sham. The CBC data showed that the MCHC was decreased in the sham+MC-2 vs the sham group, and was decreased in the HS/CR+MC-2 group compared with the sham-alone or HS/CR-alone groups. We report the use of MC-2, a linear octapeptide with sequence homology to the heparin-binding domain of IFN-γ, as a potential adjunctive treatment for resuscitated HS. We found that the addition of a single dose of MC-2 (50 mg/kg) to a resuscitation regimen consisting of blood and lactated Ringers solution (1) diminished liver injury (ie, decreased serum levels of ALT and HMGB-1) and improved histopathologic grading, (2) elevated hepatic perfusion at 3 and 4 hours postresuscitation (ie, increased EHBF), (3) improved intestinal barrier function (ie, decreased serum LPS and ZO-1 levels), (4) altered the proinflammatory response (ie, decreased serum IL-1β and liver IFN-γ), and (5) improved tissue edema (ie, decreased total tissue water in ileum). These results, all evaluated at 4 hours postresuscitation, suggest a positive trend but were mixed in their degree of improvement in the HS/CR+MC-2 group compared with the HS/CR-alone group. It is likely that a higher dose, a second dose, or a targeted hepatic dose might potentially provide further benefits in this model. We used a rat model of resuscitated HS that provides a robust in vivo environment in which to evaluate the effects of MC-2. While not perfect, this model provides suitable conditions for these initial studies that are superior to hypoxia/reoxygenation cell culture studies, which would not provide the interaction of myriad cell types and mediators involved. This HS model is limited as it relates to the current clinical resuscitation scenario. Many clinical resuscitation strategies currently used seek to minimize the amount of intravenous crystalloid administered, while this model gives 2 equal volumes to the hemorrhage amount. This experimental HS model is a relatively mild degree of HS, which, if left untreated for up to 24 hours, results in a 27% mortality rate.5 We have not yet examined the mortality rate associated with the HS/CR+MC-2 group at 24 hours postresuscitation. Our experimental model does not perfectly match currently proscribed clinical resuscitation regimens that include, for example, intravenous hypertonic saline, intravenous colloid, blood or blood product resuscitation, artificial blood products, direct peritoneal resuscitation, heparan sulfate, or hypothermia.23 We used this model because of experience and background data and because it yet fits some clinical resuscitation methods.24-29 However, studies in other resuscitation models would be appropriate. Also, HMGB-1 elevation is not specific to liver injury, because serum HMGB-1 can be elevated in many necrotic organ injuries, and the organ of origin might be difficult to ascertain.30 In this study, the derivation of the serum HMGB-1 protein is likely the small intestine and the liver, based on histopathology grading of the ileum and liver. As stated, MC-2 is a linear octapeptide construct from murine IFN-γ. Interferon gamma is a potent cytokine modulator of the innate and adaptive immune pathways.31,32 Unregulated IFN-γ expression is associated with autoimmune disorders, including polymyositis, Sjögren syndrome, and systemic lupus erythematosus. The linear peptide construct that consists only of the heparin-binding domain segment could modulate inflammation without proinflammatory effects. Thus, MC-2 might act on the inflammatory cascade by preventing the binding of nascent IFN-γ or other cytokines, chemokines, or growth factors to GAGs, which prevents them from exerting action on inflammatory pathways.8 Such an effect might prevent an influx of macrophages, neutrophils, or other white blood cells into the small intestine or liver during resuscitated HS and thus prevent inflammatory-mediated tissue injury. To our knowledge, only 2 studies exist examining the characteristics and benefits of MC-2: one in IFN-γ–GAG binding studies9 and another of MC-2 effects in an experimental model of allograft rejection.8 In the binding study, MC-2 and 4 analogs were synthesized, and relative abilities of the analogs to bind GAGs (heparin-bovine serum albumin) and to modulate IFN-γ binding were evaluated.9 The MC-2 peptide analog was found to exhibit the greatest inhibition of IFN-γ–heparin binding. In the allograft rejection studies, binding of cytokines (ie, IFN-γ, transforming growth factor-β , IFN-γ–inducible protein, regulated on activation normal T cells expressed and secreted, IL-8, and platelet-derived growth factor ) to GAGs (ie, heparin, dermatan sulfate, heparin sulfate, and chondroitin sulfate) was evaluated.8 Interferon-γ content in skin biopsies was evaluated to compare the efficacy of MC-2 with delay graft rejection in animals treated with or without MC-2. Direct administration of MC-2 to the allogeneic skin graft significantly delayed the onset of graft rejection from a mean (SD) of 5.4 (0.5) days to 12.6 (1.6) days. Histopathologic grading of the skin graft samples confirmed that the graft rejection was delayed, which provided the impetus to examine the potential benefits of MC-2 in resuscitated HS. The exact mechanisms by which MC-2 improved the measured variables of this study are not known. The mechanisms by which MC-2 provides benefits in resuscitated HS likely relate to altered balance of SIRS/compensatory anti-inflammatory response syndrome to downmodulate the proinflammatory cascade. 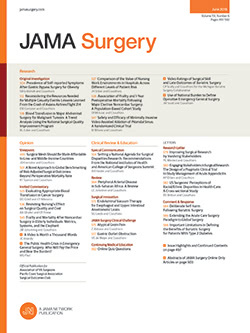 Decreased inflammatory markers, such as IL-8 and IL-1β, suggest decreased leukocyte extravasation.6,7 Fewer extravasating cells would decrease organ injury in the intestine and liver, improve portal blood flow to the liver, and prevent alteration of fluid shifts in the intestine and liver that increase total tissue water and organ dysfunction. We are currently evaluating MC-2 effects on the mechanisms of cell death by apoptosis or necrosis, oxidative stress, and degree of liver injury by more precise methods. We are planning studies to evaluate MC-2 dosing, timing of doses, and targeted drug delivery to the liver by liposomal MC-2 packaging. In conclusion, when added to the resuscitation regimen in this rat model of experimental hemorrhagic shock, MC-2 was associated with diminished liver injury, elevated effective hepatic blood flow at 3 and 4 hours postresuscitation, improved intestinal barrier function, altered proinflammatory response, and improved tissue edema in the ileum. These data suggest that the MC-2 peptide is a potential new therapeutic approach to target cytokine and chemokine interactions that might serve to prevent MOF and limit mortality in trauma-related hemorrhagic shock. Corresponding Author: Paul J. Matheson, PhD, Department of Surgery, University of Louisville, Robley Rex Veterans Affairs Medical Center, 800 Zorn Ave, Research (151), Louisville, KY 40206 (paul.matheson@louisville.edu). Accepted for Publication: July 14, 2015. Published Online: November 11, 2015. doi:10.1001/jamasurg.2015.4050. Author Contributions: Dr Matheson had full access to all the data in the study and takes responsibility for the integrity of the data and the accuracy of the data analysis. Study concept and design: Fernandez-Botran, Smith, Matheson, Downard, McClain, Garrison. Acquisition, analysis, or interpretation of data: Matheson, Smith, Matheson, Downard, McClain. Drafting of the manuscript: Matheson, Garrison. Obtaining Funding: Smith, Matheson, McClain. Administrative, technical, or material support: Matheson, Smith, Matheson, Garrison. Study supervision: Fernandez-Botran, Matheson, McClain, Garrison. Funding/Support: This study was supported by the Department of Defense grant W81XWH-11-1-0595 (Dr McClain). Previous Presentation: This study was presented at the 39th Annual Meeting of the Association of VA Surgeons; May 3, 2015; Miami Beach, Florida. Additional Contributions: We acknowledge Amy J. Matheson, Clinical Research Foundation, Louisville, Kentucky (compensated laboratory technician), for her indispensable work on this project. We also acknowledge the technical expertise of Saad P. Shaheen, MD, Robley Rex Veterans Affairs Medical Center, and Department of Pathology, University of Louisville, Louisville, Kentucky (compensated faculty member).